i was wondering how big are the babies when they are just born. and would they accept frozen baby brine straight away. or is there any other thing that you can buy that you don't have to breed yourself that they would eat straight away. It depends on the type of seahorse. Most of them need something smaller than shrimp. I use rotifers from Florada Aqua Farms for a couple of weeks then switch to baby brine. Not a chance. They are so tiny they remind me of a tiny worm with a head on it and I mean TINY. What type are these horses? Some of the fry are able to hitch and eat live baby brine and later will train to frozen. Some are unable to hitch and they are even more delicate to raise. But they are all delicate to raise. I don't know lots. It's taken me a long time to learn to get my dwarf babies to live to adulthood. BUT, they are the easiest to raise. You'll need to start cycling another tank right away. You can put a sponge filter in this tank the next couple of weeks and then use that sponge in the baby tank. Even then you'll need to do 50% water changes everyday and suction the baby potty off the bottom. People use small amounts of methylene blue (just a drop or two) to prevent fungus and just a very small amount of formalin to prevent other types of parasite and infection. If your horses are reidi they will need to start with live rotifiers. So you'll need to get a culture set up with a very good phytoplankton paste to feed the rotifiers a few times per day. Reidi babies are even too small for live baby brine. There are so many people on seahorse.org that do this all the time. I don't know how many people around here raise the babies. Hopefully someone will tell you a lot more soon. rotifiers are extremely smallish bugs, crustaceans I guess that are microscopic. They feed on phytoplankton. You can order them in live from online sources. Then you keep them alive by keeping them feed with a good phytoplankton and changing just very small amounts of water weekly. I haven't raised any of the breeds that require rotifiers. So I can't answer your questions from experience. I have read that you can just keep a jar of almost any size and an air tube without a stone is supposed to be better. That's what they say about brine too though and I use the stones with good success. If people on seahorse have said you can raise your babies with brine you must have some horses that start out big enough to hitch. What kind of horses are these? Most seahorses except dwarfs need rotifers for a couple of weeks. You should put them a small tank. I use a five galon tank because in a large tank you can't keep the food near the horses. As they grow you can put them in a larger tank. You need an airstone but not too much circulation. They are horrible swimmers and a powerhead, besides chopping them up will just push them into a corner. You also need hitching posts. I used pieces of thread with a float at the top and a small weight on the bottom. If you don't provide hitching posts, they will hang on to each other and try to swim in different directions. For the newborns I use a piece of plastic window screen. They fit in the holes and hang on as the food comes to you. You need rotifers in the tank all the time and when they grow a little, you need baby shrimp all the time. Seahorses are not like other fish. They do not have a real stomach, just a short tube and they can't store any food. 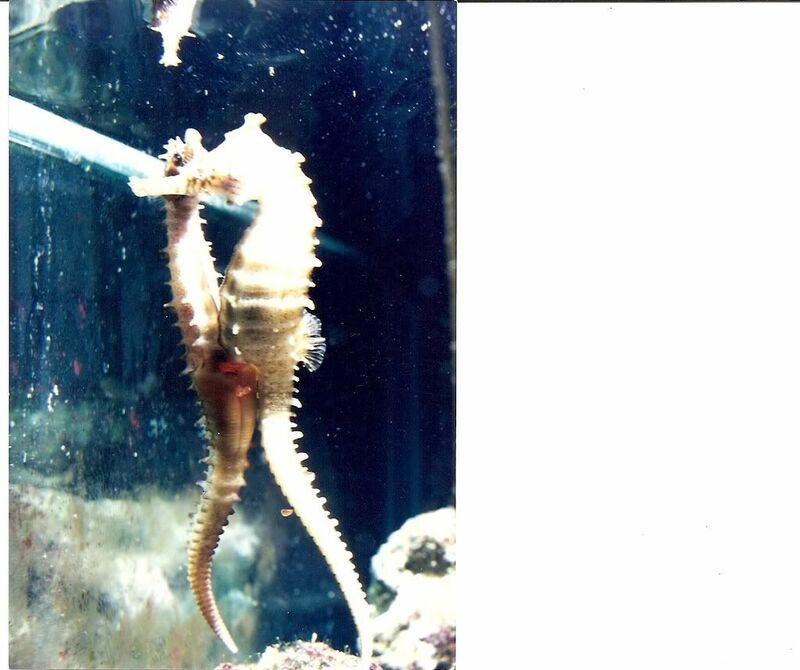 Research the type of seahorse you want to breed to see what it neds as a first food. Erectus fry can be raised on BBS. when you get to the stage of feeding them baby brine how big should the shrimp be and how do you set up something so you are just feeding them baby brine. because if you put all the shrimp eggs in a small tank most of them will get big and be a waste. The shrimp should be new born. And you need a lot of them. You either buy or build a hatchery. Here is the one I built and it has been in continous operation for years to feed my reef. Iput eggs on the black side with some airation and slide the door closed between the two sides. The next day they hatch and I slide open the door which leaves a hole about 3/8" between the two sides. I remove the airation and cover the black side. I put it in a windowsill and in 15 minutes all of the shrimp swim to the lighted side and all the egg shells stay on the black side. I close the door and lower that tube you see on the left and all the water on the left side with the shrimp comes out while all the eggs stay on the right side. I rinse the thing out and start over for the next day. It just takes a minute. It's not glue, it's acrylic solvent. 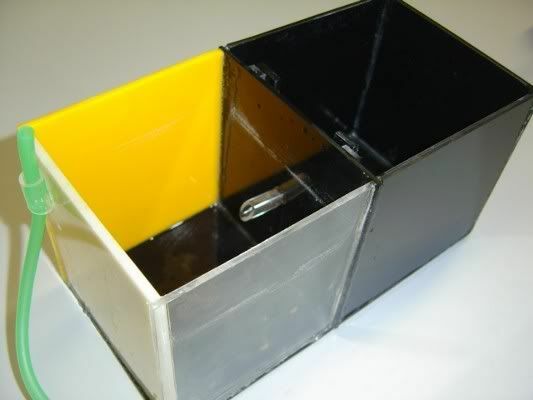 I have tried to use the little hatcheries that go inside the tank and I have no success with them. Is it the eggs perhaps that are old? Where does one get fresh stuff? How do you know they are fresh? Are these the same little shrimp that you can get in the pet store ? Are They are little juicy pink plump shrimps that the adult seahorses love to eat? Just think how much deeper the ocean would be if sponges didn't live there! Current Tank Info: 60g Reef Snowflake Clowns, Gobies etc. Gatorolsen is correct - you can raise southern H. erectus on live baby brine from birth. However, I've found that even with Selco enrichment of the shrimp, I've had poor survivorship at around the 14 to 21 day mark. By adding live mysid shrimp larvae at that time (even a few) it gets the seahorses over the hump and they do much better. Why not copepods? Tisbe pods are supposed to swim more. But I feed all kinds of pods, anything I can get and my dwarf babies start eating the pods right away. I have 2 southern erectus horses. But they haven't started mating yet.